Editor’s note: Matador Ambassador Al Mackinnon takes us through a few of his favorite images, from heaving life-and-death pits in Puerto Escondido to Galapagos sharks and moody sunsets. Beyond every photo lives a story, and this combination of Al’s nuanced eye and behind-the-scenes looks into the events and stories built into these images speaks to anyone who has traveled with a camera in their pack. 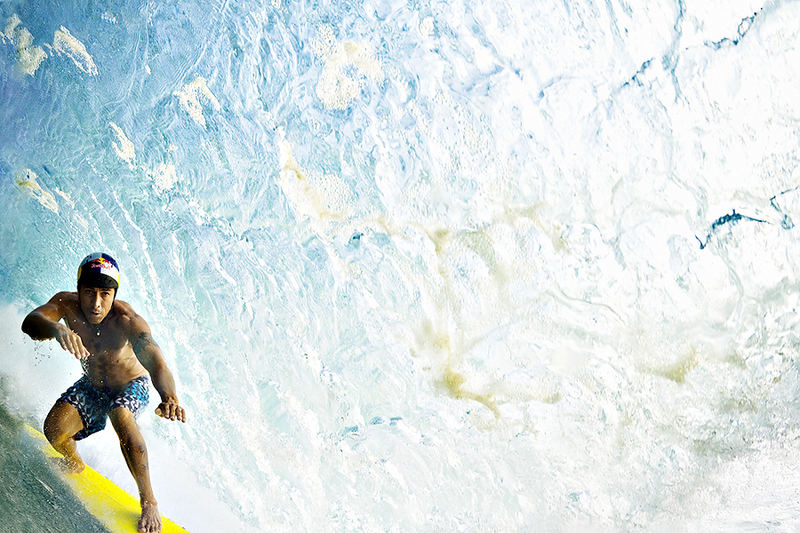 COCO NOGALES IS ONE OF THE STANDOUT SURFERS from Puerto Escondido on Mexico’s Pacific coast. Playa Zicatella, the beach fronting the town, is often referred to as the ‘Mexican Pipeline’ due to the resemblance its ferocious tubes bear to those of the famous ‘Banzai Pipeline’ on Oahu’s North Shore. Although there’s no jagged lava reef, the power and random nature of the waves keep surfers (and photographers!) on their toes. You’ll notice Coco is not wearing a leash (leg rope), which surfers normally use to prevent their board from being swept away. It is common practice at Puerto not to wear a leash, as it’s thought safer to be as far away from your board as possible in the event of a wipeout. This thinking, however, would be called into question through a tragic event that took place during the trip. I took this picture at the famous ‘Carmelitas’ section of the beach a couple of weeks into my first trip down there with big wave rider Greg Long and talented videographer Noel Robinson. Noel had put in more time there than almost anyone, was super fit and always in the mix for ‘wave of the day,’ so it was a massive shock to all when he went down not far from us and never came up. We searched the water for over an hour before the swirling currents released his body. There were many who speculated that had Noel worn a leash, his life may have been saved as the buoyant board would’ve acted as a marker above the surface indicating where he was. It’s hard to think about the ‘what ifs’ and to this day there are many who surf without leashes. I think Puerto ranks alongside Aileens in Ireland as the heaviest places I’ve swum with a camera. As I write this, I’ve just received the wonderful news that Brazilian big wave surfer Aldemir Calunga, who copped a severe beating at Puerto a week or so ago, has just come out of a coma. At the same time, Rusty Long (Greg’s brother) is having to delay a trip we have planned, as he’s recovering from a dislocated shoulder he sustained after getting bucked off a particularly heavy wave there a few weeks back. Even though these athletes are massively fit and experienced, the ocean is a capricious beast, and when riding the heaviest waves on the planet sometimes things go wrong; with great reward comes great risk, but it seems to be a gamble these guys are prepared to take. RIP Noel Robinson. Thanks for all the good times and the advice on the lineup at Puerto — between you and Greg, I couldn’t have had better teachers. 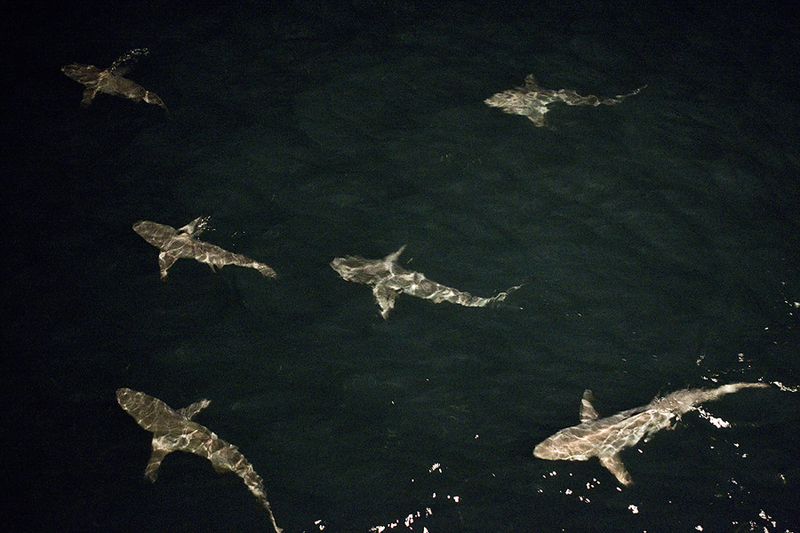 Galapagos sharks cruising off the back of the liveaboard at night. As their name suggests, these sharks are native to the Galapagos Islands but are widespread throughout the tropics, particularly island chains. These seemed docile, moving very slowly, waiting for potential prey to be attracted by the lights on the boat. Their behaviour would change in the blink of an eye — on the first bite sharks would converge in a flash, a frenzied thrashing would ensue, and then as soon as it had begun it was over as if nothing had happened. Night diving wasn’t on the agenda. 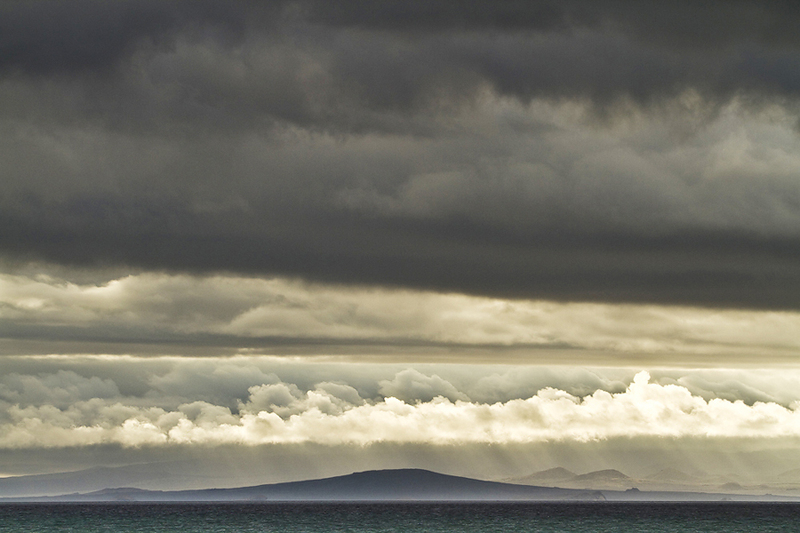 Shield volcanoes and rain clouds, Galapagos. I’ll remember this for a long time, it was my first evening in the islands and I’d just had a swim off a stunning white sand beach when the overcast sky started to do something rather special. German/Portuguese Nike team rider Nic Von Rupp, perfect day, England. Nic is an exceptional tuberider, and I’d been planning on taking him to this special place for some time when the perfect weather chart materialised. A call to Portugal was made and Nic flew in the following morning. This was right at the end of the day as the light was fading — after he’d gorged himself on perfect waves for hours! It’s not often that England gets really good waves, but believe it or not a few days a year those waves can be world class. Indeed, Nic still regards this as one of the best day’s surfing he’s ever had, and that’s a big call when you consider his yearly itinerary takes in Hawaii, Indonesia, and Tahiti! 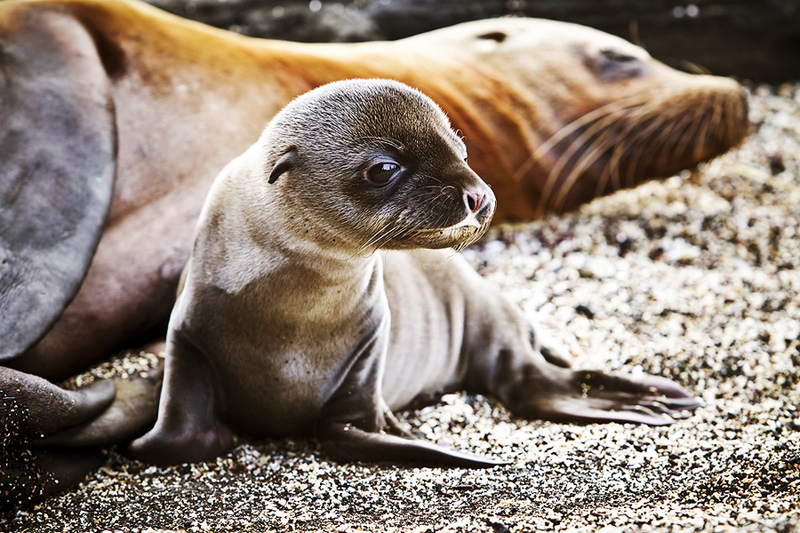 Young sea lion pup, Galapagos. We have two types of seals native to the UK, but as far as I know there are no sea lions. I first saw them in California, but it wasn’t until one was within touching distance in the Galapagos Islands that I learnt the most obvious way to distinguish sea lions from seals; one has ears, the other does not! Sunset bathing a Galapagos shield volcano and a blanket of altocumulus stratiformis clouds in sumptuous evening light. The weather was quite changeable for the first part of the trip, but by the end things settled down and we were treated to hot sunny days and balmy evenings. 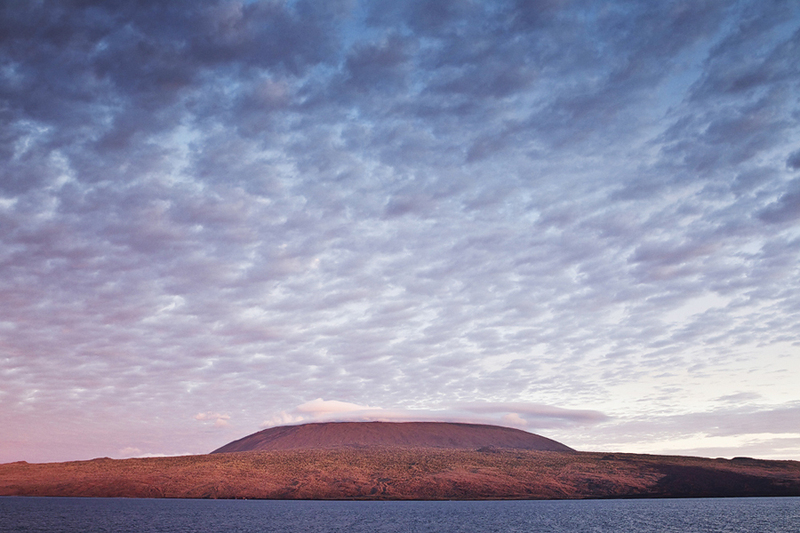 The skyline of Galapagos is dominated by the shield volcanoes, their understated profile a result of low-viscosity lava that tends to flow far from the crater rather than heaping up to form steep slopes. Though shield volcanoes occur in other parts of the world, they will always mean Galapagos to me. Ensenada, Baja California. This is almost the ultimate Todos Santos big wave surfing crew. From left to right: Sam Lamiroy, Rusty Long, Mike “Snips” Parsons, Rob Brown (kneeling), Kelly Slater, Twiggy Baker, Greg Long, Jessica Spraker, Ramon Navarro, Alfy Cater, Mark Healey, and Noel Robinson. We’d just had a beautiful glassy session at the break known as ‘Killers’ at Isla Todos Santos, which lies a few miles offshore — I think it was Kelly’s first time back there in ten years. Jarrad “Klaus” Howse, Scotland. Klaus absolutely loved surfing this wave despite it being a few degrees colder than his native Australia. This type of wave is known as a ‘slab,’ so called because the swell line approaches shore and trips over a shallow wedge of rock to form hollow tubes. This one doesn’t break very big but is perfect and intense — the sort of qualities pros look for in a surfbreak. This picture features in Drew Kampion’s celebrated book on the life of surf wetsuit pioneer Jack O’Neill and illustrates perfectly why those of us who surf more than 50 degrees north are so grateful. Waves like these would simply not be accessible without the insulation. Thank you Jack O’Neill for making all these winter spots possible!